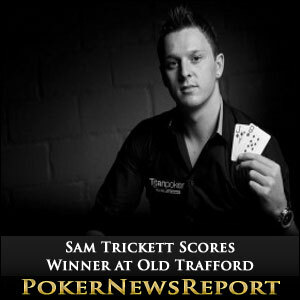 Sam Trickett won the climax of Party Poker´s Road to Old Trafford promotion at the weekend and immediately donated the £10,000 first prize to charity. Party Poker has been running its “Road to Old Trafford” promotion since June, and promised those who qualified through its VPP and Freeroll promotions a weekend to remember. The event kicked off with Rio Ferdinard´s 10-year testimonial against Spanish La Liga team Sevilla (Sevilla had not read the script and won the game 3-1) and concluded with Manchester United´s victory in the Community Shield being shown live at the stadium. Between the two soccer matches, stadium tours were organised for players participating in the poker tournament, which culminated this weekend when 169 players took their seats for the £250.00 buy-in event. Among those who bought in directly were former Manchester United players Dwight Yorke, Quinton Fortune, Norman Whiteside and former England skipper Bryan Robson, but it was the UK´s most formidable professional poker player – Sam Trickett – who won the event after two days of play. Trickett, who had been wearing a signed Manchester United shirt throughout the game, immediately donated his winnings to Rio Ferdinand´s “Live the Dream” charity and said I am really happy to win this event – I played for fun but I felt I really had to win at Old Trafford – I made it my mission! Trickett then left with Ferdinand for a tour of Manchester United´s training facility in Carrington. The Road to Old Trafford does not stop in Manchester for the good folk at Party Poker, who are off to Cyprus this week to host the PartyPoker.com Big Game on Thursday – just before the start of the $4,400 buy-in WPT Merit Cyprus Classic on Friday, in which Sam Trickett is again expected to play. Players who cannot make it to Cyprus at short notice, but who want to get involved in some of the live action provided by Party Poker, have the opportunity to qualify online now for the World Poker Tour Grand Prix de Paris at the world-famous Aviation Club from October 25th – October 30th, and the WPT Montreal at the Playground Poker Club from November 29th until December 5th.